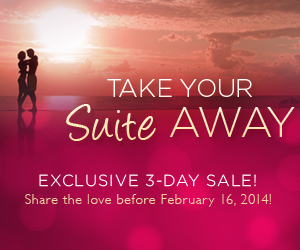 Take Your “Suite” Away this Valentine’s Day! It is time to Take Your “Suite” Away to Secrets St. James Montego Bay! Show your sweetheart just how much you care when you take advantage of our great rates! This entry was posted in Secrets St. James, Uncategorized. Bookmark the permalink. ← Fan Photos from Secrets Puerto Los Cabos Golf & Spa Resort!